SHERWOOD — The "Pin Chain." Simply, it's a big, thick chain with a Sherwood High School "S" symbol hanging off the bottom. For a Bowmen wrestler, it's an honor to be wearing it. And, for a Sherwood grappler, it's even better when you have to quickly take the Pin Chain off and hand it to the next guy. And the Bowmen did plenty of that in their match with Century. Sherwood, notching five pins on the night, powered its way to a 50-22 victory over the previously unbeaten Jaguars in a Pacific Conference dual match held Jan. 16 at Sherwood High School. "We call it the 'Pin Chain,'" said Sherwood sophomore Bryan Cuthbertson, who won his 220-pound match by fall. "So every time someone gets a pin, they get the chain until the next person gets a pin. It's motivation. It's pretty nice carrying a big chain with the Sherwood logo on it." "That's the 'Pin Chain.' I think a little kid who roots for us, he made it," said Sherwood junior Nick Hekker, who won the 113-pound match by pin. "Whenever you get a pin, you get to wear it. It's definitely motivation. And it gets the team excited and gives us some momentum. It's definitely something that you hope you don't have to wear long. But it's cool to wear it." With the loss, Century moved to 3-1 in Pacific Conference matches. Sherwood improved to 2-1 on conference duals with the win. "It went pretty well. We knew that this was going to be one of the tougher duals of our new league, so we knew we had to come out and take it seriously," Cuthbertson said. "We came out prepared. We knew what we had to do. We had to outwork them, outwrestle them, and just wrestle harder than they did." "It was good," Hekker said. "We just fought hard. We fought how we should and, overall, we just came together as a team." Sherwood freshman Ethan Ritchie was the first Bowmen who got to wear the Pin Chain during the Jan. 16 match, as he pinned Century's Jordan Salvador in a time of 1 minute and 4 seconds in the opening 106-pound bout. But Ritchie didn't get to wear the Pin Chain very long as, in the very next match, Hekker pinned Sean Cabanban in 1:13, giving the Bowmen a 12-0 lead in the team score. "I felt confident going in," Hekker said. "I know I'm better than I think, and I just went out there, competed, and it all worked out. Hard work, confidence and just determination got me the pin." At 120 pounds, Sherwood senior Haden Munson scored a 7-3 victory over Bennet Parkinson. In that match, Parkinson scored on a takedown with 50 seconds in the second round to tie the score at 2-2. But Munson answered with a reversal and a 2-point nearfall to take a 7-2 advantage to the third round. At 126 pounds, Sherwood senior Gaven Jolley had the fastest win of the night, as he pinned Will Musser in a time of 0:19, giving the Bowmen a 21-0 lead in the team score. Sherwood kept rolling from there. Bowmen junior Philip Resch got a 7-2 decision win over Uriel Rodriguez at 132. Sophomore Dallen Jolley pinned Davin Chamberlain in 1:43 at 138 pounds and sophomore Malachi Tishendorf got a 17-2 technical fall win over Jackson Wang at 145, upping the Bowmen lead to 35-0. Century got on the scoreboard with a major decision win at 152, but junior Brody Stevens got Sherwood back on the winning track, as he got a 5-4 decision win over Jesse Hendren at 160. 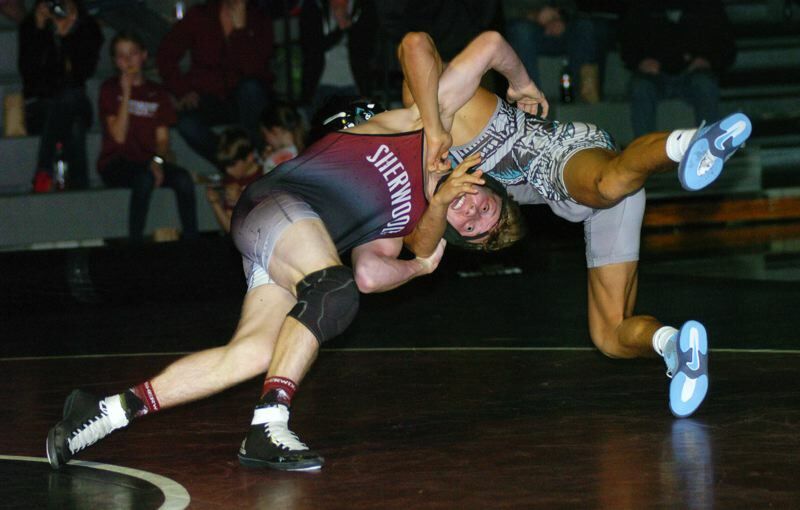 Bowmen sophomore Ashton Sarono-Ramos then picked up a forfeit win at 170, pushing the Sherwood lead to 44-4. Century scored pins at both 182 and 195 to cut the margin to 44-16. But Cuthbertson stepped up for the Bowmen at 220. In his match with Tau Tofaeono, Cuthbertson opened the second round with an escape and followed that up with a takedown coming with 1:16 left in the period, giving him a 5-1 lead. But that didn't matter, and Cuthbertson picked up a fall at 3:08 mark, giving Sherwood a 50-16 lead and making him the last Bowmen to wear the Pin Chain. "In a match, you always have to be on the move to get the next point," Cuthbertson said of his victory. "Even if you're up by 10, you have to look ahead to next point. You're always going for the pin. You're just constantly going. That's what makes you good." Century picked up a win by fall at 285 pounds to make the final score 50-22. "We're going build off this and take this momentum to the next dual," Hekker said. "This was pretty fun. Being here as a team and wrestling. It's something totally different than any other sport," Cuthbertson said. "We had some tough losses that we're going to learn from. We've already gone up against our toughest opponent, Newberg. From here on, we need to face every opponent like it's Newberg." Sherwood, on Friday, opened action at the Oregon Classic, being held at the Deschutes County Fairgrounds and Expo Center in Redmond. Action at that dual match tournament continues on Saturday. 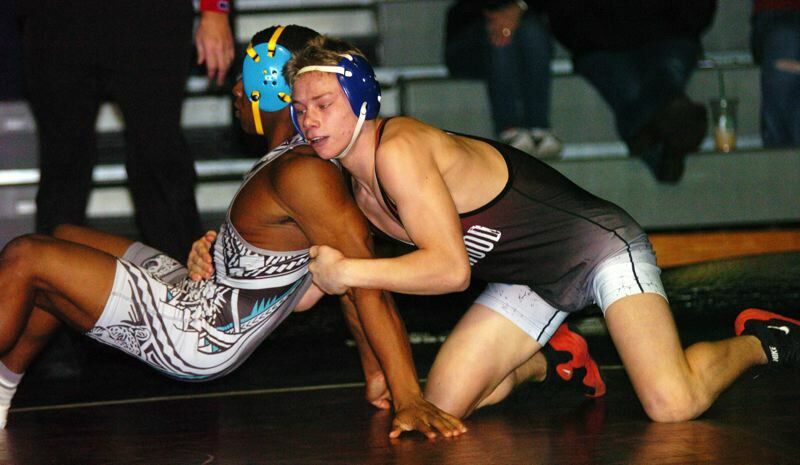 On Jan. 24, Sherwood will host Forest Grove in a Pacific Conference dual match. Varsity bouts are set to start at 7 p.m.